The C2CNT team focus is a comprehensive solution to climate change, a principal challenge facing the planet today. In this industrial age, massive quantities of greenhouse gases, principally carbon dioxide, have been released into our atmosphere through the combustion of fossil fuels to meet humankind's industrial, transportation and energy needs. These greenhouse gases trap infrared heat increasing the temperature of the planet (global warming) at an accelerating rate. Climate change causes species extinction. As many as half the species on the planet face extinction this century if climate change is not abated. Climate change is causing sea-level rise, which is already threatening disappearance of low-lying countries, glaciers and icebergs, along with causing interior flooding, drought, famine, disease, hurricanes, increased incidence and strength of tornados, communication, power and transportation disruptions, and causing wide-spread increasing economic cost to both developed and under developed countries throughout the world. At George Washington University we’ve discovered the inexpensive transformation of the greenhouse carbon dioxide into a widely useful and highly valued product. In our C2CNT process, CO2 is directly transformed to hollow nanofibers, “carbon nanotubes,” products with remarkable properties of conductivity, nanoelectronics, higher capacity batteries, flexibility, with greater strength than steel and widespread use as carbon composites. The conversion of CO2 to pure carbon nanotubes provides the most compact form to capture carbon dioxide and mitigate climate change. The market for carbon composites provides lighter weight alternatives to metals, and is used today in the Boeing Dreamliner, high end sport cars, and athletic equipment. The market is experiencing an explosive growth comparable to the historical start of the plastic industry. Previously carbon nanofibers were made by expensive processes such as chemical vapor deposition or polymer pulling and could not be made from CO2. Our C2CNT team is rapidly scaling-up our new chemistry which directly converts CO2 at high rate to carbon nanotubes using low cost materials. The C2CNT team is committed to reversing the rapid anthropogenic buildup of greenhouse gases, and perceive CO2 not as a pollutant, but rather CO2 as a useful resource. We are working to incentivize CO2 removal from the power, industry and transportation sectors by rapidly and efficiently transforming CO2 into a valuable product. Greenhouse gas removal by transformation into carbon nanotubes. In C2CNT, carbon dioxide is bubbled into, and dissolved in a molten carbonate bath. The carbon dioxide (CO2) is split by electrolysis at electrodes immersed in the molten bath into oxygen (O2) at the electrode called the anode, and into carbon, as pure carbon nanotubes, at the electrode called the cathode. 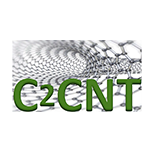 Extensive technical details of the C2CNT process are delineated in Tech information and in our open access, peer-reviewed scientific studies published (Licht et al) in 2015 and 2016 in Nano Letters, ACS Central Science, Scientific Reports (Nature.com), RSC Advances, Energy Conversion and Management, Carbon, and new studies are appearing in 2017. Report of discovery: CO2 split at high yield to CNTs by molten electrolysis (Nano Letters 15, 6142 2015). Experimental validation of low energy C2CNT (CO2 to CNT) pathway (J PhysChem C 119, 23342 2015). Quantum calculation of low energy C2CNT pathway (RSC Advances 6, 27191,2016). Batteries with C2CNT CNTs have much higher capacity (ACS Central Science 2, 162, 2016). CO2 is the CNT source material by isotope labeling (Scientific Reports – Nature 6, 27760, 2016); Flue gas (natural isotope abundance) CO2 forms the expensive nanotube products, ibid. NG CC power plant analyzed wo/w C2CNT (Energy Conversion & Management122, 400, 2016): without C2CNT, output per ton fuel: 2.7 ton CO2, $909 electricity & $0 of CNT; with C2CNT, output per ton fuel: 0.0 ton CO2, $835 electricity & $225,000 CNT. A variety of molten carbonates form CNTs at high yield (Carbon 106, 208, 2016). A wide portfolio of uniform CNTs are synthesized (“Transformation of…. CO2…” J CO2 Utilization 2017). C2CNT cement plants are introduced and analyzed with a significant economic incentive to eliminate current plant CO2 greenhouse gas emissions (“Co-production…” J CO2 Utilization 2017). Licht interview on BBC World Newshour; click on the audio button at "The Bottom of the Barrel?" This will start the Newshour, and slide ahead to the interview between time 18:52 and 23:00.14. Year three milestone: Global deployment, starting a C2CNT 10 yr plan to lower atmospheric CO2 to < 400 ppm. 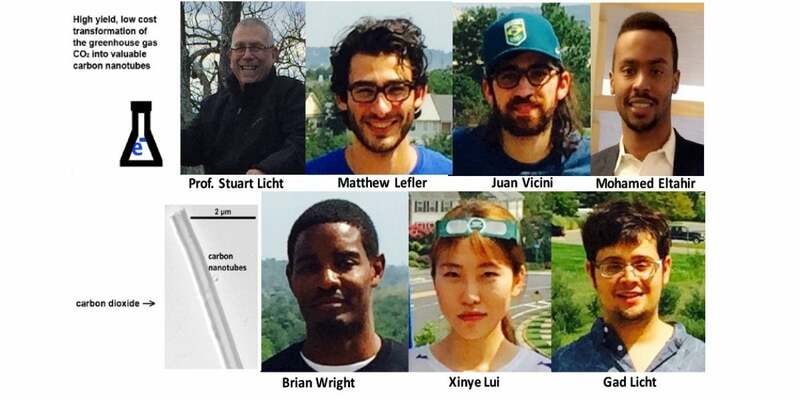 Team Leader Bio: The C2CNT path started in 1987 with the team leader’s theory and experiment for the efficient use of solar energy to drive simultaneous electrical and chemical production  and new room and high temperature electrochemistries to store energy . The C2CNT process is the culmination of 30 years ongoing development of a technical solution to a sustainable future. The process matured to a new theory [3a] & method [3b] of solar energy conversion to enhance of splitting water to fuel by using the full spectrum of sunlight (visible & thermal) and electrochemistry to greatly increase the solar energy conversion to hydrogen fuel efficiency. This led to a variety of new molten salt electrolysis chemistries to produce societal staples such as fertilizer, cement and metals including iron, but without the CO2 emissions normally associated with those processes . In 2009, the theory of solar thermal electrochemical process (STEP) water splitting was extended to carbon dioxide splitting [5a], leading to the experimental demonstration in 2010 of CO2 splitting at > 50% solar energy efficiency [5b], and the subsequent demonstration in molten salts of the direct transformation of CO2 to variety of carbon, plastics precursors, and synthetic methane fuels [5c]. However, such products made from CO2 are valued at only ~$40 to $400 per ton and therefore give little financial impetus to the removal of this greenhouse gas. Starting in 2012 – 2013 it was realized that a several order of magnitude more valuable product, carbon nanotubes, could be produced by the direct molten carbonate electrolysis of CO2 leading to the new C2CNTprocess, and providing a significant economic imperative to the removal of this anthropogenic greenhouse gas. Today, the team leader is a Prof. of Chemistry at George Washington University, and he previously served as a Program Director at the National Science Foundation. He has received awards including the Hildebrand Chemical Prize (2016), The BASF Energy Storage Prize in honor of BASF’s 150th anniversary (2015), the Electrochemical Society Energy Technology Award (2006) and the Alcoa Science Prize (1994). Licht, Nature, cover article, 330, 148, 1987; Licht et al, Nature, 326, 863, 1987;Nature, 345, 330, 1990; Nature, 354, 440, 1991. Licht et al, Science, 261, 440, 1991; Science, 285, 1039, 1999; Energy & Environ Chem, 6, 3646, 2013; ACS Central Sci, 2. 162, 2016.
a. Licht, EChem Com. 4623, 2002; Licht, J Phys Chem, 4243, 2003. b. Licht et al, Chem Comm, 3006, 2003.
a. Licht, J Phys Chem C, 2009. b. Licht et al, J Phys Chem Lett, 2010. c. Licht et al., Adv. Mat., 2011; Adv. Energy Mat., 2015; Adv. Science, 2015; Adv. Mat. Tech., 2016.